Want to make your house look rich but don't have the funds to decorate like a millionaire? These simple tricks can make it look like you spent a lot more than you really did. If you want to add a little glamour to a room but you don't want to spend a lot of money, there's no greater tool than gold spray paint. A single coat can take small accessories like picture frames, vases, and trays from bland to beautiful. And if you want something a little more significant, try painting a shelving unit, side chair, or mirror frame. 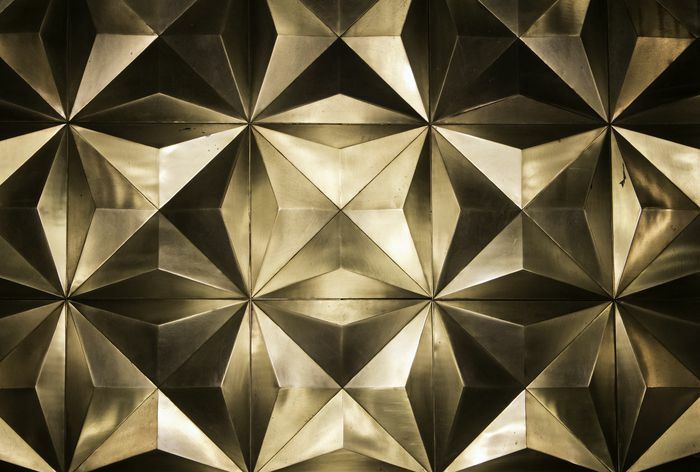 Gold is inherently luxurious, and adding touches throughout a home adds a sense of luxury in a way nothing else can. Crown molding bridges the gap between the walls and the ceiling, adding a finishing touch that looks both traditional and elegant. Like most architectural details, crown molding is associated with upscale homes. Despite this perception, crown molding can be installed for very little money, particularly for people with decent DIY skills. Just remember that highly decorative styles work best in larger rooms, while small rooms can benefit from simple styles. Wainscotting is a type of wood paneling that is installed on the bottom half of a wall. In the past, it was used as a way to add extra insulation to a wall, but these days it is used for purely decorative reasons. It usually consists of pieces of molding that are put together in square or rectangular shapes below the chair rail. Traditional wainscotting can be expensive to install; however, there is a DIY trick that is both easy and inexpensive. Simply arrange pieces of chair rail on the wall in square or rectangular patterns and install using finishing nails. You get the same elegant look at a fraction of the price. And remember, for the most sophisticated and elegant look, paint the molding the same color as the walls. Fresh flowers are the best thing you can add to a room to give it an instant lift. They breathe life and add a great burst of color. If you want your home to look more expensive, splurge on large bouquet in strong, deep colors. This doesn't mean you need to have a giant, over-the-top display in every room, but make sure any arrangements you display are not sparse. A big, bountiful bouquet of flowers on a coffee table or mantle adds instant class. Flimsy displays make it look like you cheaped out. Even the humblest of homes look more elegant when items are thoughtfully placed rather than casually strewn. Areas to focus on include bookshelves, coffee tables, mantels, and console tables. When it comes to bookshelves, stack books horizontally and vertically, layer in other accessories (photo frames, decorative objects, small floral displays, etc), and create vignettes that are pleasant to look at. For coffee tables, choose a few objects that compliment each other and contrast the shapes a bit (remember to keep them below sight lines). For mantels, consider symmetry by creating an evenly balanced display. These things may seem minor, but organizing shelves and other display areas in a visually pleasing way will make your entire room look more thought-out. Large-scale art makes a big impact, and as a result, can make it look like you spent a lot of money. Large, abstract paintings that span all the way across the back of a sofa or bed and all the way to the ceiling grab your attention and loom over the room (in a good way). In the case of overscale artwork, large geometric and floral patterns tend to look better than pictorial scenes, but ultimately you need to do what suits your taste and looks best in your home. Want to add instant class to a room? Nothing works as well as a decorative ceiling medallion. While historically they were meant to help call attention to hanging light fixtures, they're beautiful in their own right. Ceiling medallions were particularly popular in the Victorian era, and putting them in today's homes can bring back some of the elegance of that time. Like most architectural details, they add elegance in a way nothing else can. Applying nailhead trim to furniture is an easy, DIY way to quickly get a high-end look. Traditionally, nailhead trim was reserved for upholstered pieces, lending them a tailored appearance, but in recent years people have been using it a lot of different ways. One of the most popular applications is to take some trim and apply it to a piece such as a chest of drawers or a side table. You can apply it in any pattern you like, be it a simple border or an intricate pattern. Depending on the complexity and the quality of the piece, you can either use traditional tacks or adhesive strips. You can also apply nailhead trim around windows, doors, and even area rugs and runners. The rule of threes states that "things that come in threes are funnier, more satisfying, or more effective than other numbers of things", and this is most definitely true in decorating. Anytime you're creating a display or hanging multiple items, notice how groupings of three just feel right. This isn't limited to just the number three – it applies to all odd numbers. So if you have multiple items you want to use, bump up the number to 5, 7, or 9. There's a common misconception that adding things to a room makes it look more chic and expensive. While it's true that the more you buy the more you spend, you can actually make the room appear more expensive by putting less in it. In order to create a sophisticated-looking space, simplify your styling and pare things down. Giving items space to breathe means they can really stand out and shine.